Pizza Meatballs are so scrumptious. Talk about mouthwatering comfort food! I found this delightful recipe in a Good Housekeeping cookbook the first year I got married. Meatballs are filled with Monterey Jack cheese, served in a delicious spaghetti sauce and served over noodles with melted Monterey Jack cheese on top. 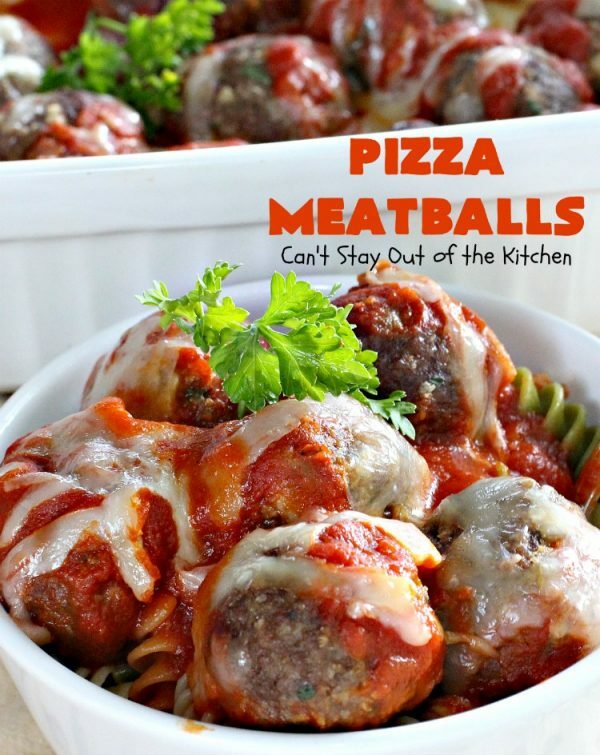 This fantastic recipe is kid-friendly, economical, and so easy to make. It’s great for Saturday night dinners sitting in front of a fire or just anytime you need to prepare a quick meal. It’s a great comfort food you’re whole family will enjoy. I won’t kid you. I have yet to be able to make this entree without cheese leaking out of the meatballs when you cook them, but they are still fantastic nonetheless. Use any kind of spaghetti sauce and serve over any kind of noodle. It’s nice over dumpling noodles or bow-ties. We love this delicious meatball recipe. It’s a really nice change from regular spaghetti and meatballs. If you’re interested in something different yet extremely tasty why not give this recipe a whirl. 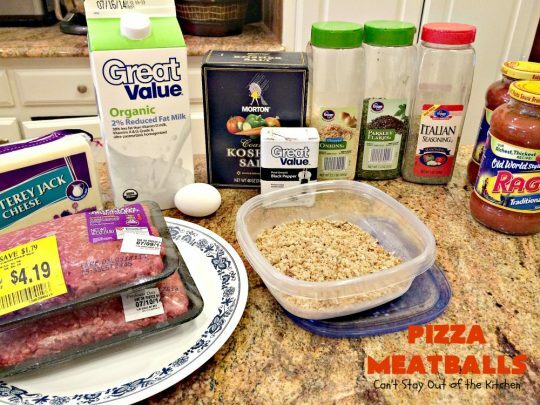 This Pizza Meatballs recipe is a keeper. Our family have always enjoyed this recipe and believe you will too. I originally made this recipe in January of 2013. I put so much cheese on top of the meatballs that you couldn’t really see the meatballs or sauce very well. I’ve recently remade this recipe (July 2014), and now I share some fresh pictures with you. 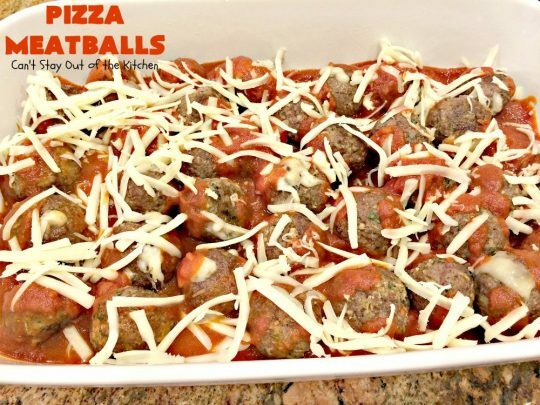 These pictures show only about one-fourth of the cheese that is regularly sprinkled on top of the meatballs and, as a result, you can see what this delightful recipe is really supposed to look like. Quite frankly, we felt this amount of cheese was sufficient and the meatballs didn’t need any more. I used tri-color rotini to serve the meatballs over top of this time, but we have used spaghetti or whatever pasta I’ve had on hand in the past. Enjoy. Pizza Meatballs is a fabulous Italian recipe. 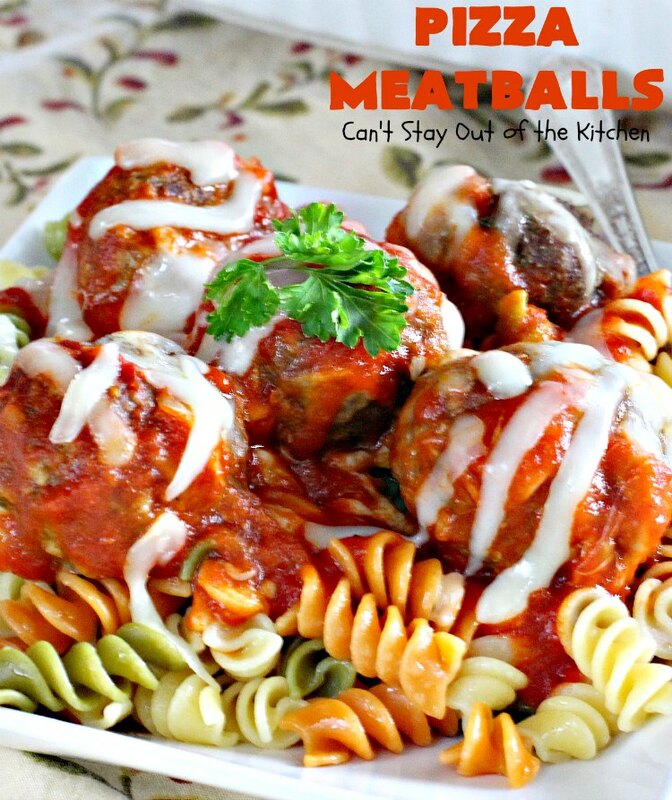 Our family has always enjoyed this wonderful pasta dish. 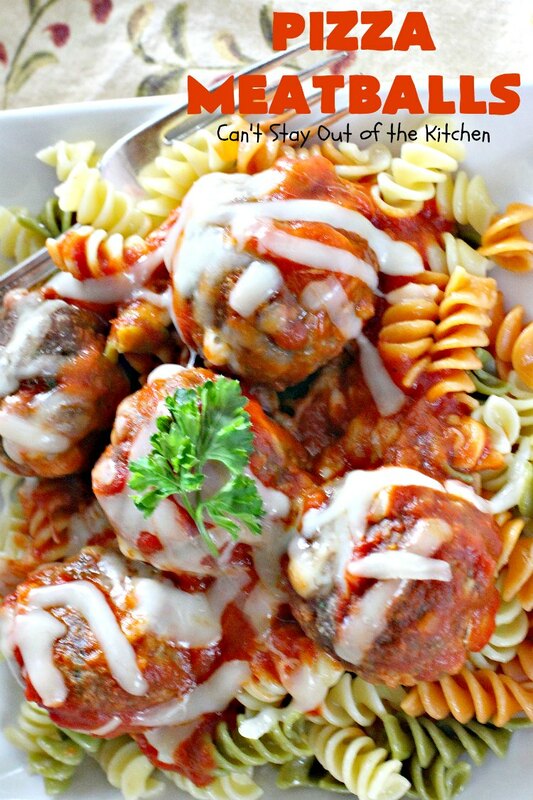 These luscious meatballs are filled with Monterey Jack cheese. Yum, yum. Then the meatballs are covered with spaghetti sauce and more Monterey Jack cheese. I used these ingredients. I used my own homemade breadcrumbs. Place lean ground beef in a mixing bowl. Add seasoned bread crumbs. I used homemade bread crumbs and added parsley and Italian seasoning. Add milk, egg, dehydrated onions, salt and pepper. Mix all ingredients together by hand until thoroughly mixed. 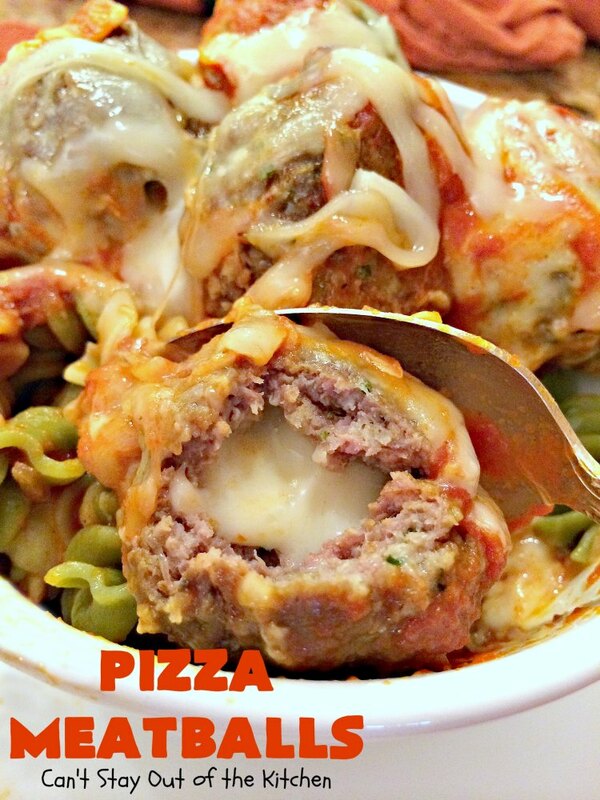 Use Monterey Jack cheese to stuff inside the meatballs. Cut about 8 ounces in cubes. Shred the other 8 ounces. I cut the cubes in 36 pieces. 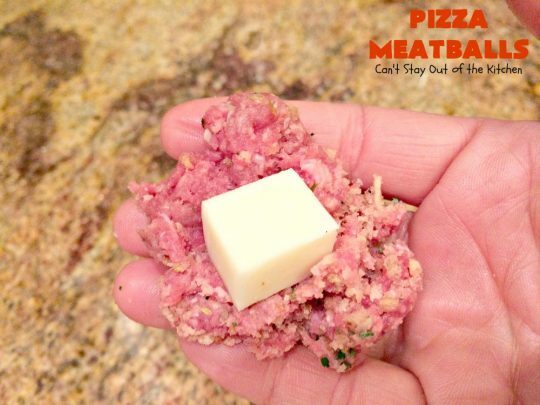 Form the meatball around the cube of cheese. Do your best to seal the meatball and roll tightly so the cheese doesn’t leak out of the meatballs while baking. Place meatballs on a cookie sheet that has been spayed with cooking spray. Bake about 20-30 minutes at 350. 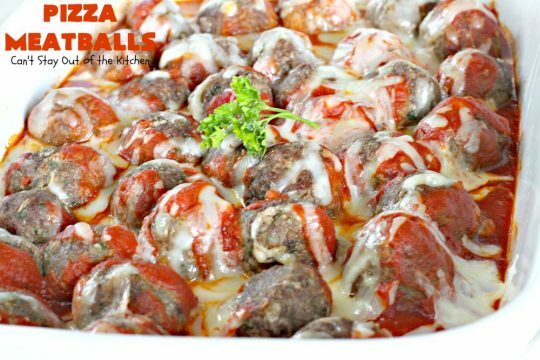 No matter how hard you try to get the perfect meatball, some of the Monterey Jack cheese will leak out of the meatballs. 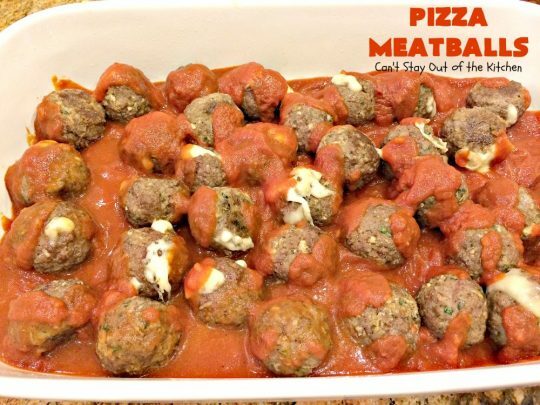 Place meatballs in a 10×15″ baking dish that’s been sprayed with cooking spray. Spread spaghetti sauce over top of the meatballs. Any kind will do. Whatever you prefer. Sprinkle with Monterey Jack cheese. (This is only about 1/4 of the amount on hand that is available to sprinkle over top of the meatballs). 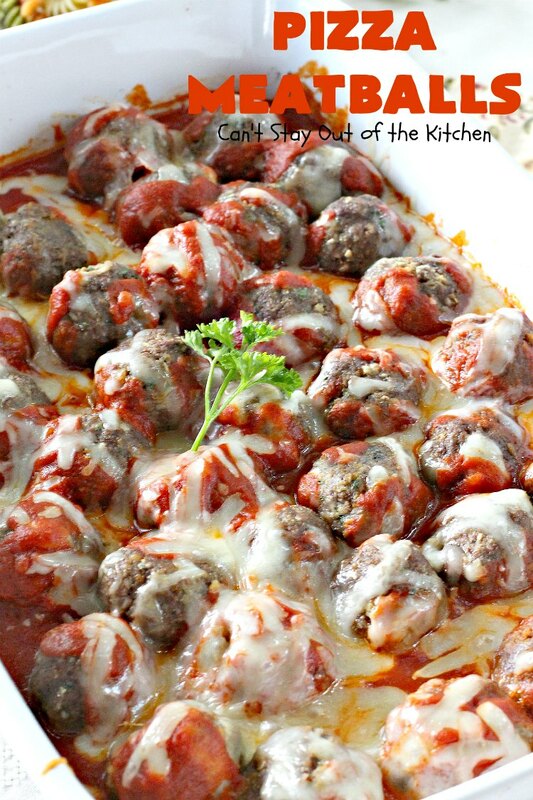 Bake meatballs at 350 for an additional 20 minutes or so until cheese melts and sauce is bubbly. Serve over your favorite pasta. Here’s the inside of one of the meatballs. 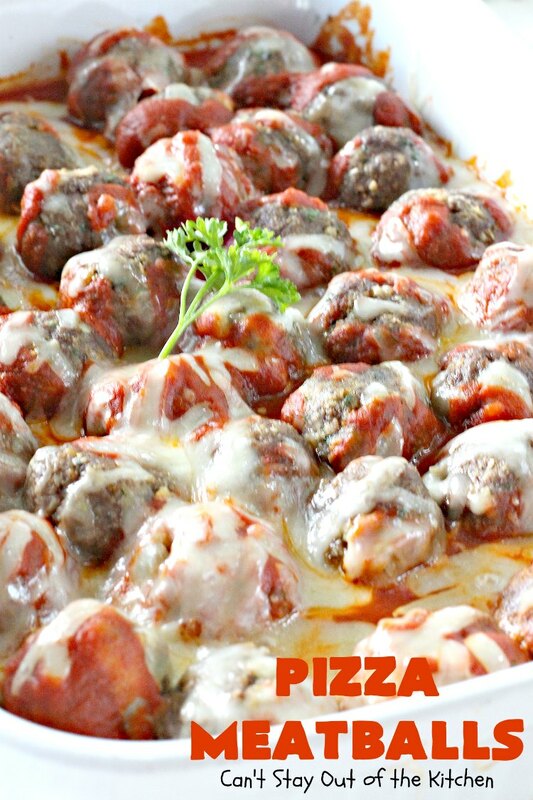 Here’s a plate of Pizza Meatballs. Your kids will love this tasty meal. The meatballs are so delectable. Everyone enjoys them. The recipe is also very easy. 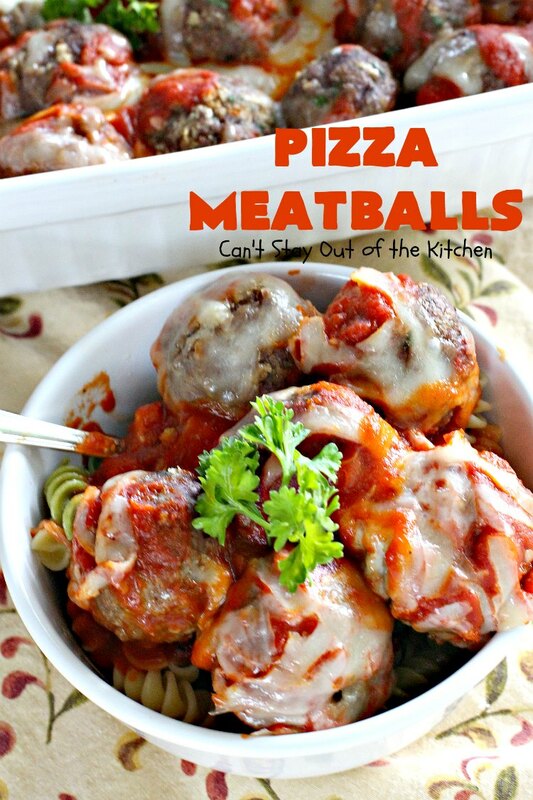 Pizza Meatballs is comfort food at its best. Delicious pasta main dish with pizza flavored meatballs in spaghetti sauce and garnished with Monterey Jack cheese. This recipe has an option for baking the dish or making it on the stove top. It's a 30-40 minute meal that's perfect for weeknight dinners when you're short on time. Cut part of cheese into twenty-four to twenty-six ½” cubes. Shred remaining cheese and set aside. 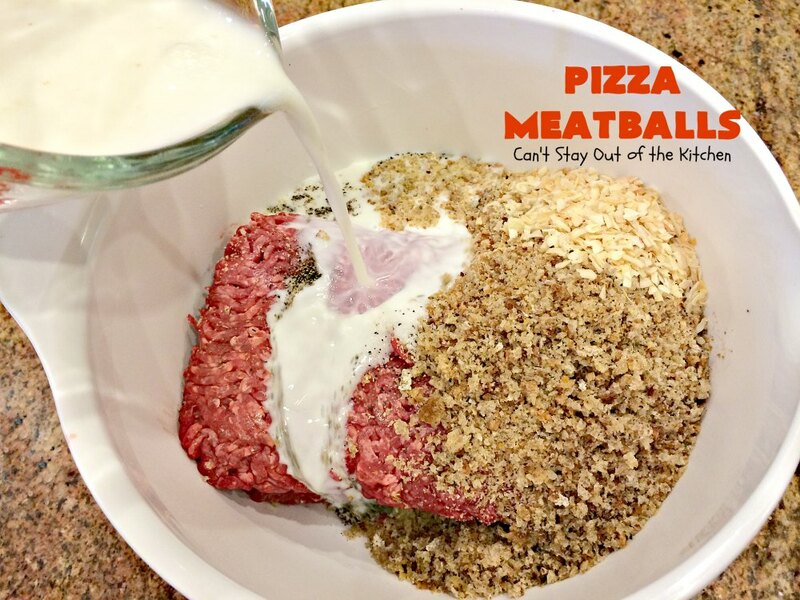 In large bowl, with fork, mix beef, bread crumbs, milk, egg, onion, salt and pepper. Shape some mixture around each cheese cube to make 1 ½ inch meatballs. Seal well or cheese will leak out during cooking. Option 1: Place meatballs on cookie sheet sprayed with cooking spray. Bake at 350 for about 15-20 minutes or until meatballs are cooked. Remove from oven and place in large baking dish. Cover with spaghetti sauce, then cheese. Bake at about 350 for 10-15 minutes or until heated through. 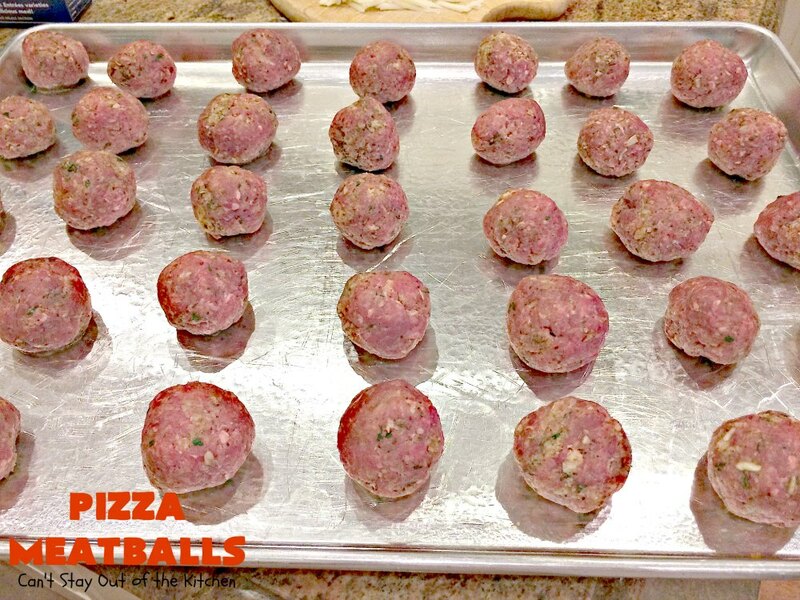 Option 2: In 12-inch skillet over medium-high heat, in hot salad oil, cook meatballs until browned on all sides. Spoon drippings from skillet; add spaghetti sauce. Reduce heat to low; cover and simmer 10 minutes. Sprinkle meatballs with reserved shredded cheese. Serve over wide dumpling noodles or noodles of your choice. Recipe adapted from Good Housekeeping cookbook. 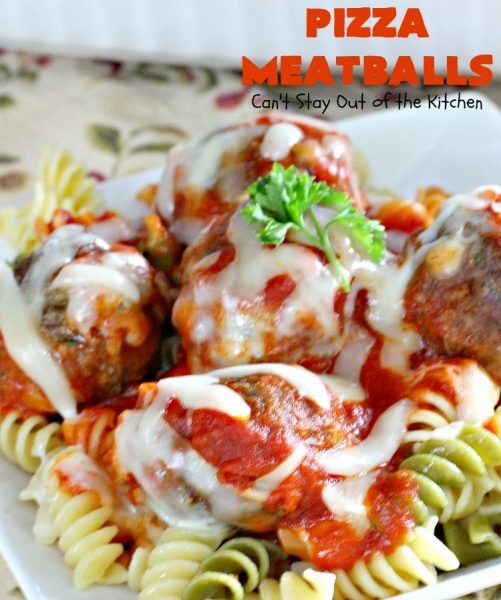 Delicious pasta main dish with pizza flavored meatballs in spaghetti sauce and garnished with Monterey Jack cheese. This recipe has an option for baking the dish or making it on the stove top. 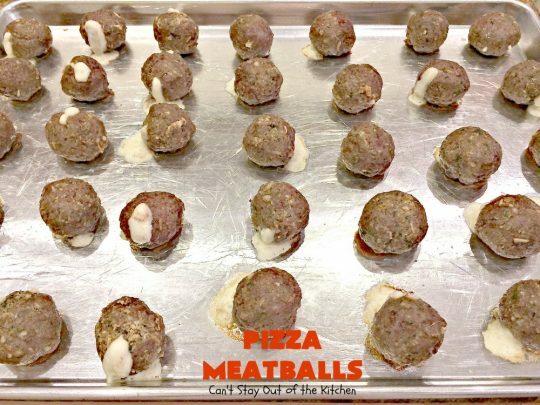 Place meatballs on cookie sheet sprayed with cooking spray. 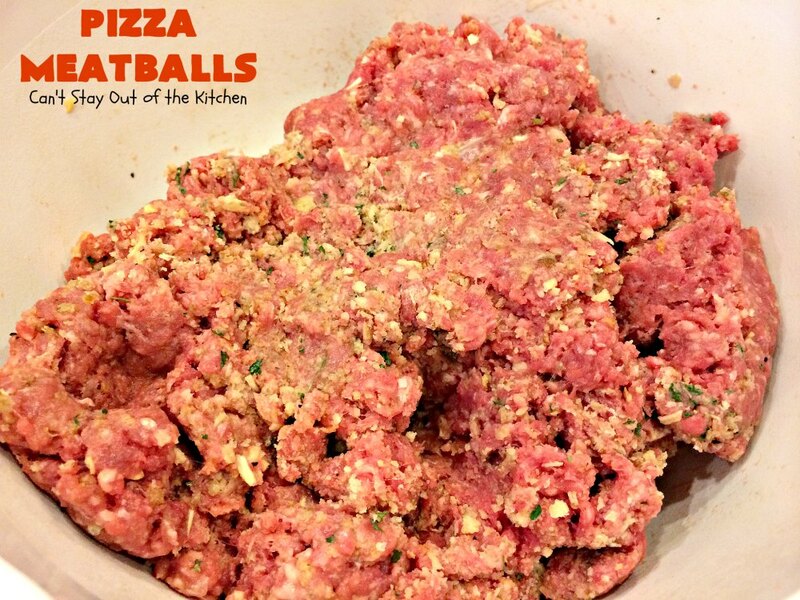 In 12-inch skillet over medium-high heat, in hot salad oil, cook meatballs until browned on all sides. Don’t these meatballs look fantastic? Pizza Meatballs was one of the first recipes I found as a newlywed. We’ve made it many times over the years. Enjoy the spectacular flavors of Monterey Jack cheese in this wonderful recipe. It’s amazing. We hope you enjoy this family favorite recipe as our family has over the years. I have not made meatballs in a long time. My kids love them. Yours look delicious!! My kids would love all the cheese. I am going to pin this one. Hopefully, others will love to make this for their family. It would be a great back to school celebration kids meal. These really are good. The trick is using a high quality beef (like 97% lean) and wrapping the meat around the cheese extremely well so it doesn’t all leak out when you cook them! I hope you enjoy the recipe! Ground turkey might also work. Since this is an Italian recipe rather than an Indian one it is based on that cuisine and herb choices, but I bet it would taste marvelous fixed the way you like it, too. this is perfect timing Teresa thanks for this recipe! 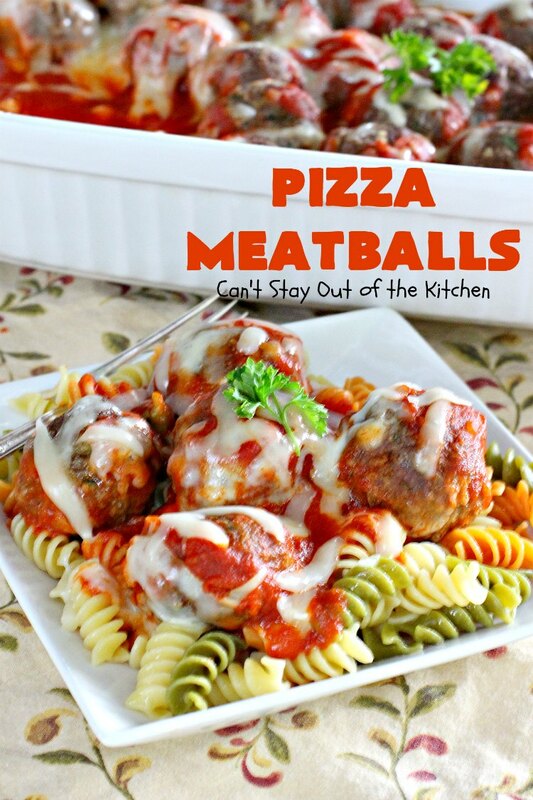 I also love how you put the pasta and meatballs next to each other, i would have never thought to do that! That way they can be transported without making a lot of mess! Hope you enjoy. I’m trying this as soon as I can! I love pizza and this looks incredible! It’s really a delicious recipe. Do your best to try to seal the meat so the cheese doesn’t leak out. Some will anyway. Enjoy. Yeah, guys definitely love this recipe.